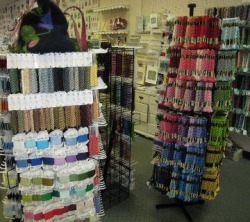 Here at a stitch in time we pride ourselves as the best one stop shop for all your needlepoint needs in Northeast Florida. We stock hundreds of hand painted canvases, including dozens of Needlepoint stockings and all the threads and accessories to complete your project. If we don't have what your looking for, please ask and we will try our best to get it for you. 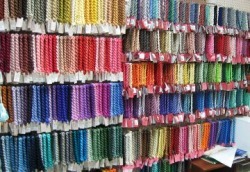 DMC floss - Almost every color of Pearle 3 and Pearle 5 is stocked. And we also stock dozens of colors of DMC Perle 8 and 12. 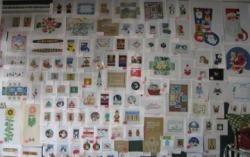 Part of the wall of canvases.